One of the greatest attributes one has to have in this life in order to be successful is to learn how to be productive. Unfortunately, not many people know where to start. They often look online and want tools that they can use to do a lot of the work for them. It is sort of like a get-rich-quick scheme in a way, except without all of the swift riches. If you ever find yourself losing your way and want to get more things done, follow some of these tips. 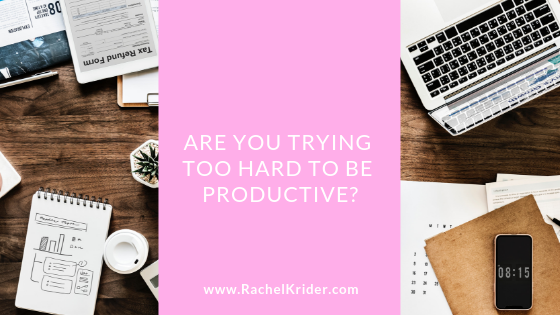 One of the many things that can prevent someone from being productive is by trying to do too much at one time. Instead of frantically searching the internet for tools and tips on how to be productive, give yourself time to rest, relax and allow your body to refuel itself. You cannot perform optimally if you are always operating under stress. Work on yourself first, and then you can move on to bigger pursuits. One of the worst things you can do when trying to be productive is wasting time on things that do not take priority. A lot of digital tools tend to suffer from the issue of stagnation, and you should be sure to clean things up at least once a week for your own convenience. This can also help with any preconceived notions that any tools are failing you. The world around you is always innovative and changing around you. Therefore you will have to learn to adapt. This comes in the form of refining any tools to make sure they can work for you. You should remember that the reason why you are searching for tools is that the ones you currently have aren’t getting the job done for you. If you are still having trouble, why not make it a goal to settle on a tool that you want to use. Make it a point of emphasis to pick a set of tools and stay committed to them for about a year. Once you get acclimated to a certain tool long enough, you may find that it’s ideal for you.